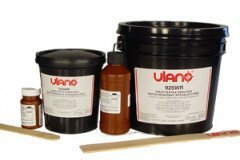 Shares the main characteristics of Ulano's TZ emulsions, but with a higher solids content and even better resolution, edge definition, and exposure latitude. Stencils produced with 925WR/995WR are completely water resistant and very durable. 925WR/995WR comes with a syrup diazo sensitizer, for faster and surer mixing. Recommended for imprinted sportswear applications. PHTHALATE-FREE Clear versions without dye 925WR/CL and 995WR are the same as 925WR/995WR, but supplied clear for easier see-through registration. If you have any questions about this product by 925WR Emulsion, contact us by completing and submitting the form below. If you are looking for a specif part number, please include it with your message.